Deep soft-tissue lipomas are subfascial benign mesenchymal soft-tissue tumours composed of white mature adipose cells. They usually present between 30 and 60 years of age as a painless mass with or without restriction of movement and nerve entrapment symptoms. They are less common than superficial lipomas, and they can be intramuscular or intermuscular. Intermuscular lipomas like the case above are considered giant if greater than 5cm in size and are uncommon in the upper extremity. Lipomas are well circumscribed and composed of fat with thin septa. They are therefore homogeneously echogenic on ultrasound, low density on CT (-60 to -120HU) and isointense to fat on MRI with signal drop out evident on fat suppression sequences. Lack of internal vascularity and enhancement are also a feature. 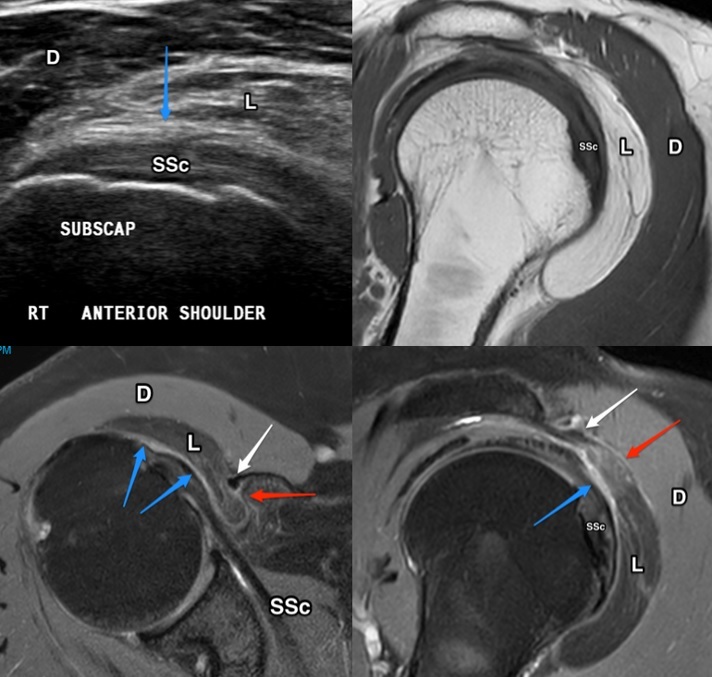 Non-adipose or enhancing soft tissue components, thick irregular septa and infiltration of adjacent structures should raise the possibility of liposarcoma. Nishida J, Morita T, Ogose A, Okada K, Kakizaki H, Tajino T, et al. Imaging characteristics of deep-seated lipomatous tumors: intramuscular lipoma, intermuscular lipoma, and lipoma-like liposarcoma. Journal of orthopaedic science : official journal of the Japanese Orthopaedic Association. 2007;12(6):533-41. Elbardouni A, Kharmaz M, Salah Berrada M, Mahfoud M, Elyaacoubi M. Well-circumscribed deep-seated lipomas of the upper extremity. A report of 13 cases. Orthopaedics & traumatology, surgery & research : OTSR. 2011;97(2):152-8.